It is easy to become a little immune to the charms of ethnic tribal groups when living in Thailand; there are many and the tourist industry around them fairly developed. However, a visit to Kengtung in eastern Shan State in Myanmar will change your view on ethnic tribes in the region and open your eyes to the diversity of the different groups. 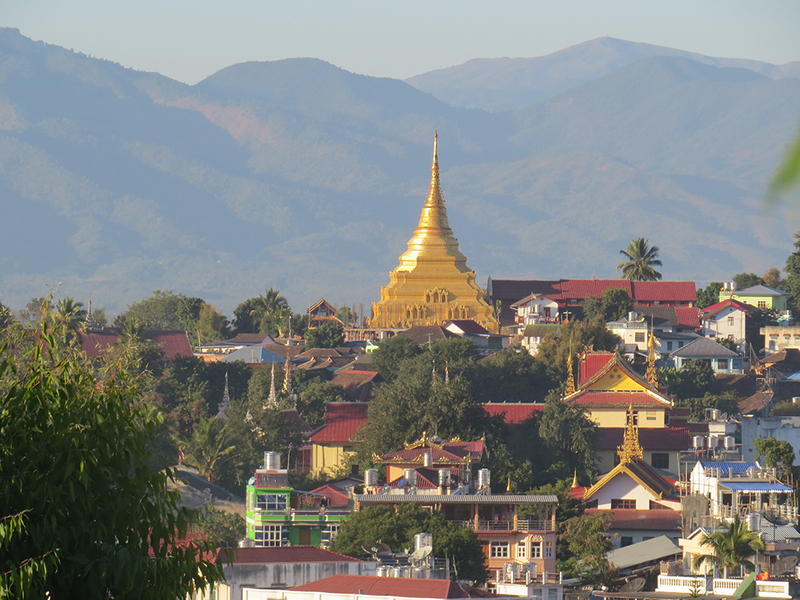 The gold pagoda of Wat Jom Kai dominates the skyline in this small town, built in the 13th century the temple is in the Shan style. Kengtung should be on your list of places to visit for those seeking something different and off the well-beaten tourist track but not afraid to forego luxuries. 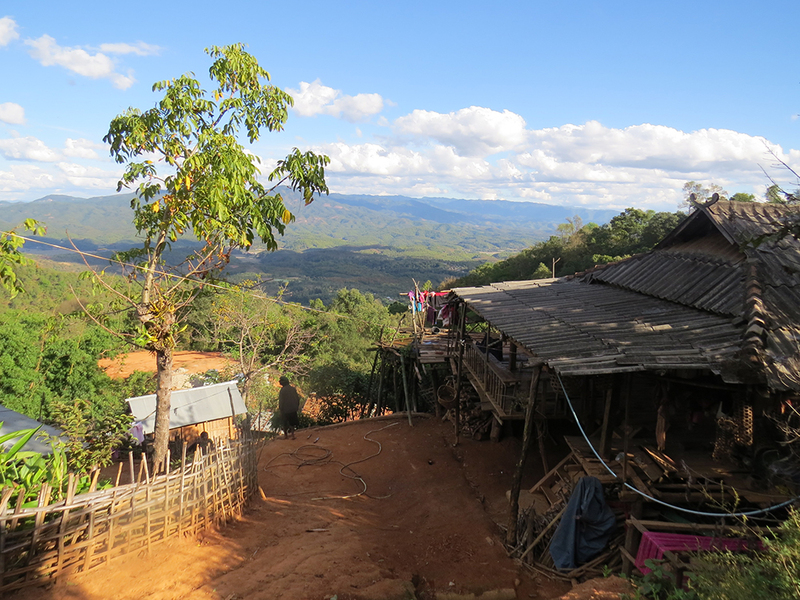 This charming town is set in the high plains of Eastern Shan State in Myanmar and is ringed by picturesque mountains. The bumpy four-hour bus ride from Tachilek offers spectacular scenery and images of a rural lifestyle fast disappearing. Stop at the tiny town halfway and find a great selection of silkworms to munch on. If bugs aren’t your thing there is also fruit and Shan noodles. Arrive in Kengtung before sunset and enjoy the spectacular view of the sun setting behind the mountains. Although a newer construct, the giant standing Buddha is a draw in Kengtung. A city with many names, Kengtung, also known as Chiang Tung, Kyaintong and Cheingtung, is also a city of many personalities. The city plays host to many ethnic groups; the Tai Khun, Wa, Akha, Lahu, Eng, and Burmese. Kengtung was once at the crossroads of trade between China and the Kingdom of Siam and that is visible in the diversity of the region. 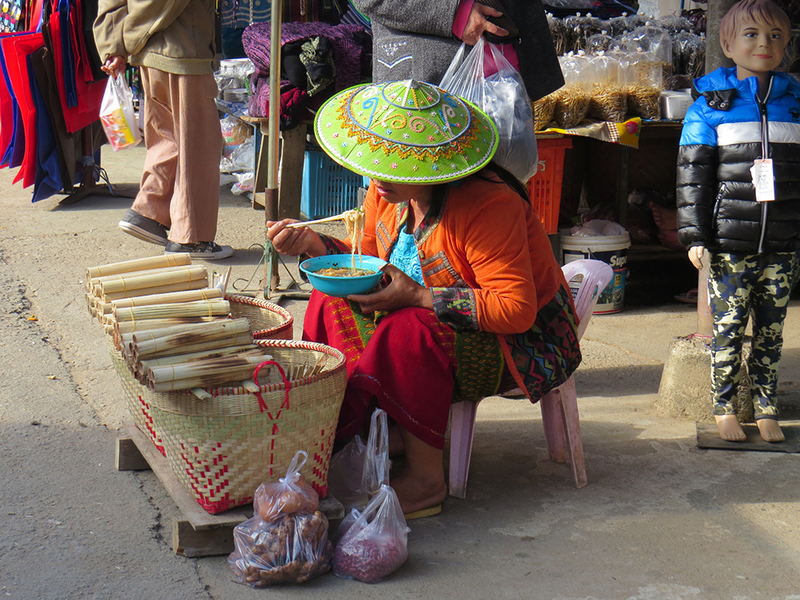 A local vendor enjoys some noodles while waiting for customers. The hats are handmade and embroidered during the rainy season. Local legend states that the city was founded in the distant past by the Wa people; history shows that the grandson of King Mengrai, founder of Chiang Rai and Chiang Mai, was sent to conquer the Wa and rule this important location in the early 13th century. 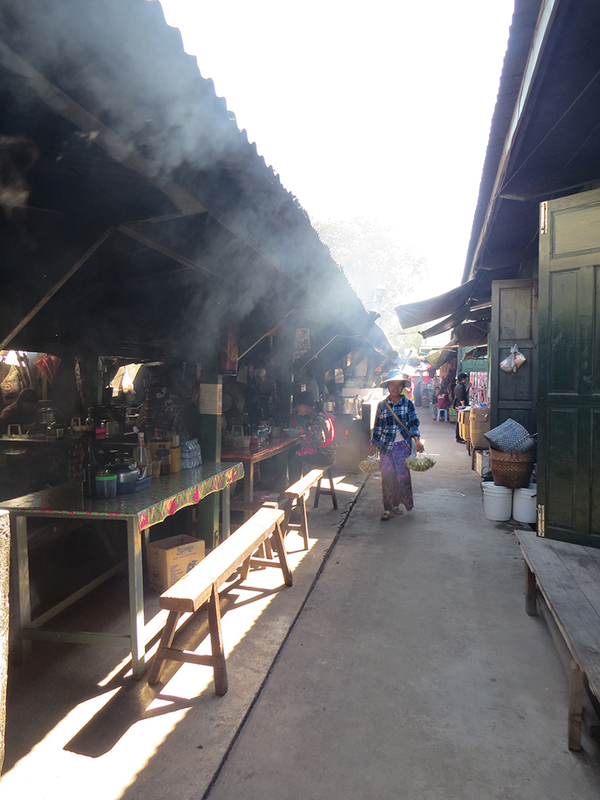 Cooking is all wood fire in the Kengtung Market and the narrow alleys are filled with smoke as people fill up on Shan noodles, baked flatbread and more. That turbulent past is not visible in this little city with a population of 171,000. The winding roads and stunning views of the lake make this city charming and walkable – but beware the motorbikes, cars and pickup trucks that definitely do not make way for pedestrians. Fortunately, traffic is not heavy but its best to be on guard when crossing the street! 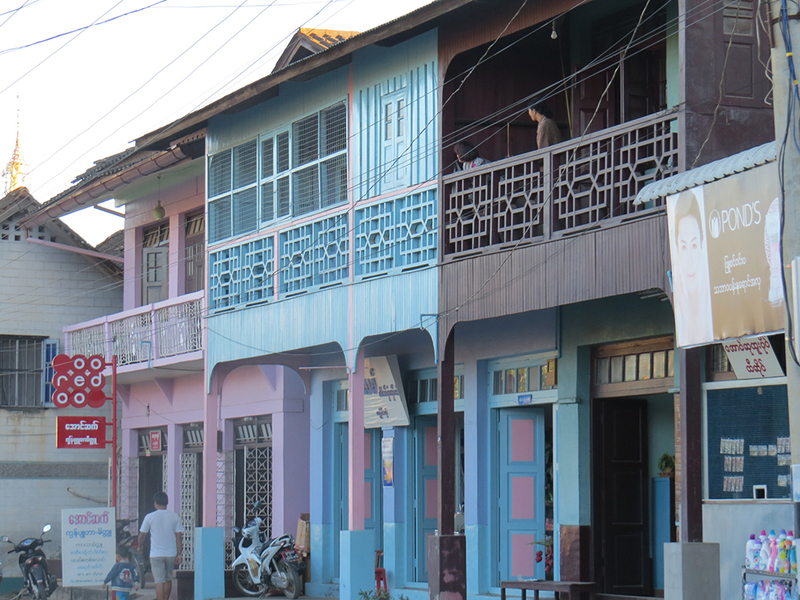 Kengtung retains much of its charm with old wooden buildings in good repair lining the narrow winding streets. Kengtung has a very small tourist industry, mostly Thais on pilgrimage to some of the important temples; around 5,000 people a year. However, many of the locals speak Thai well enough for communication, a few speak English but, in this far flung region, it is not widespread despite the colonial British past. Wat Jom Kai was built in the 13th century after the city was taken by the grandson of King Mengrai and absorbed into the Lanna Kingdom. The people of Kengtung are friendly and helpful, and while the power goes off occasionally staying in the one big hotel in the city, The Amazing Kengtung Resort, ensured electricity and decent WiFi. The resort itself stands on the site of the old palace that was torn down by the military in the early 1990’s, the fabulous teak palace built by the Shopas in 1902. 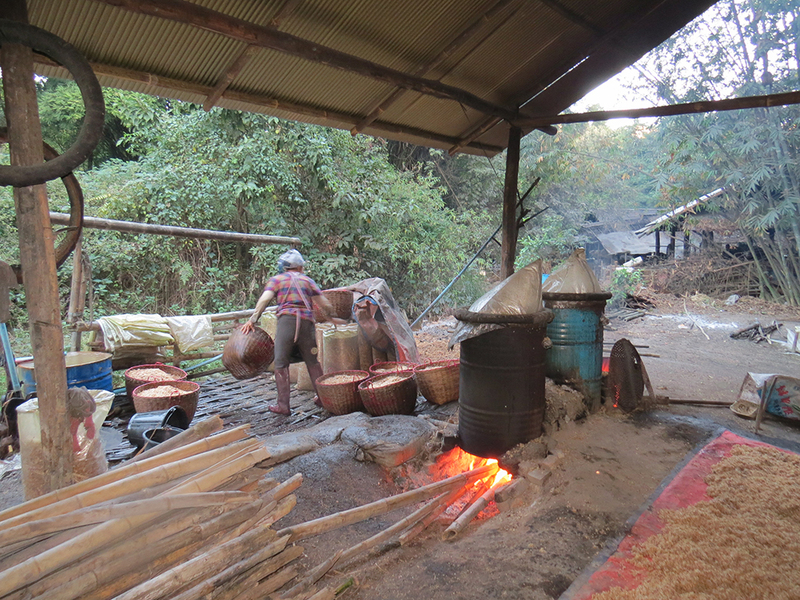 Villagers brew rice whiskey the old fashioned way. Amazing Holidays Hotels & Resorts took over the property in 2015 obtaining a 70-year lease from the hotel’s owner, the Ministry of Hotels and Tourism. Aung Myo Min Din, the chairman of the group, plans on closing the hotel for four months this year for a major renovation of the property to showcase the local Shan heritage and upgrade the property to a four-star resort in line with the group’s other properties. A refocus on the local culture would be welcomed by the locals who had protested heavily at the destruction of the palace. This Eng grandmother sports the traditional blackened teeth of her tribe. The Amazing Hotel Kengtung already offers a diverse menu of delicious Shan meals; at the modest price of only US$15 for a four-course meal, this is a terrific value-for-money dinner. The hotel itself is set in a stunning garden and is walking distance from Naung Tong Lake with its many roadside stalls. The hotel is set in the heart of the old city with quaint shophouses, British colonial architecture and large pagodas and temples. The 18 meter standing Buddha constructed overlooking the city points to the heart of the city while the skyline is dominated by the gilded stupa of the 13th century Wat Jom Kai, reportedly built during the reign of the Lanna Kingdom. 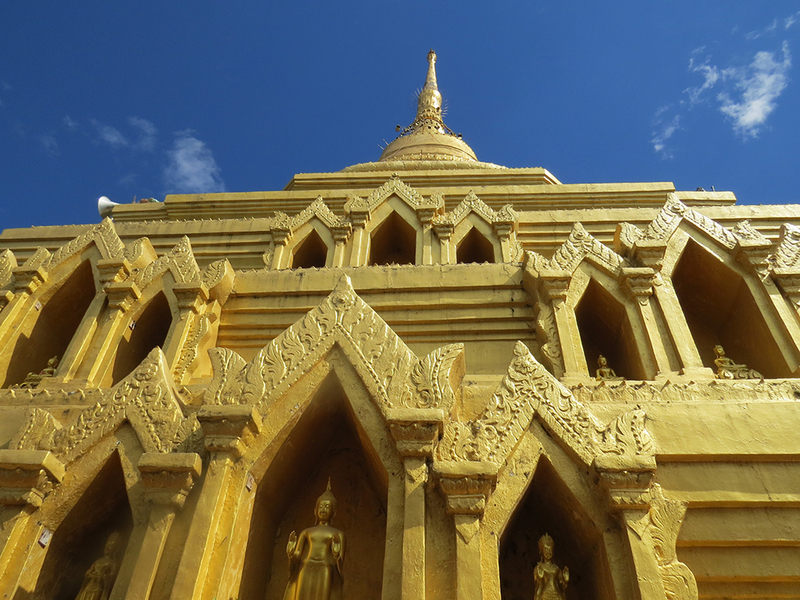 Nearby is the stunning Wat Maha Myat Muni with gorgeous Tai murals set in the heart of the city. Eng villagers live in bamboo and wooden homes high above the valley and eschew the modern life, living the traditional animist ways. The daily market in Kengtung is outstanding and still very much for locals; filled with villagers from the hills selling fresh fruits and vegetables, meat, and freshwater fish. There is a large array of prepared food as well as handicrafts, and the market is dotted with tea and coffee shops. Be sure to sit down and enjoy a hot milky tea with traditional baked flat bread and watch the market life. In the evening stroll down to the river and have a Myanmar Beer with some grilled meats (usually pork) while watching the sun set behind the mountains. 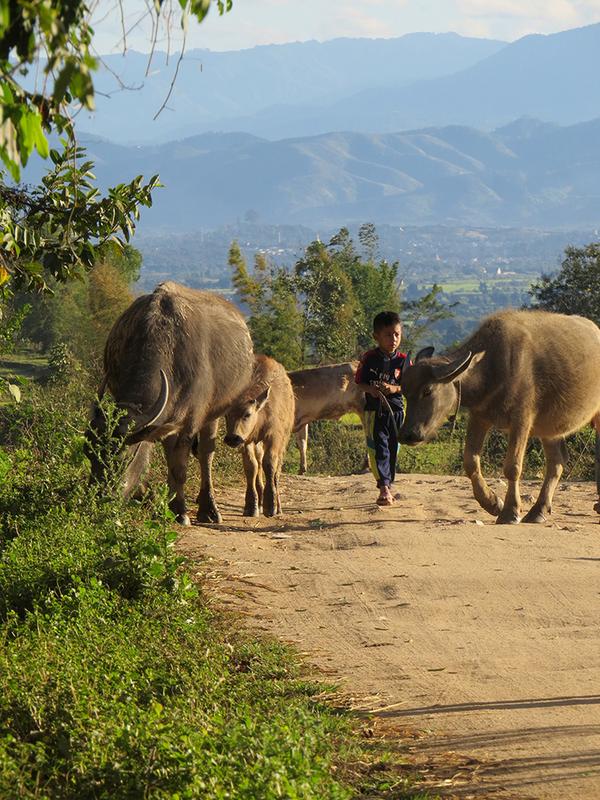 A young Akha boy brings the cows back up the hills from grazing in the valley at the end of the day. Sightseeing in the city can be easily done on foot or by hired car and driver. Foreigners are not allowed to self-drive nor are they allowed to hire motorbikes or cars so to get out in the country it is necessary to sign up for a trek or obtain a local guide and driver at your hotel. The Myanmar government does not allow for overnight stays so trips will need to be within a few hours of the city but that won’t be difficult as there are many things to see and do in an hour or two drive. 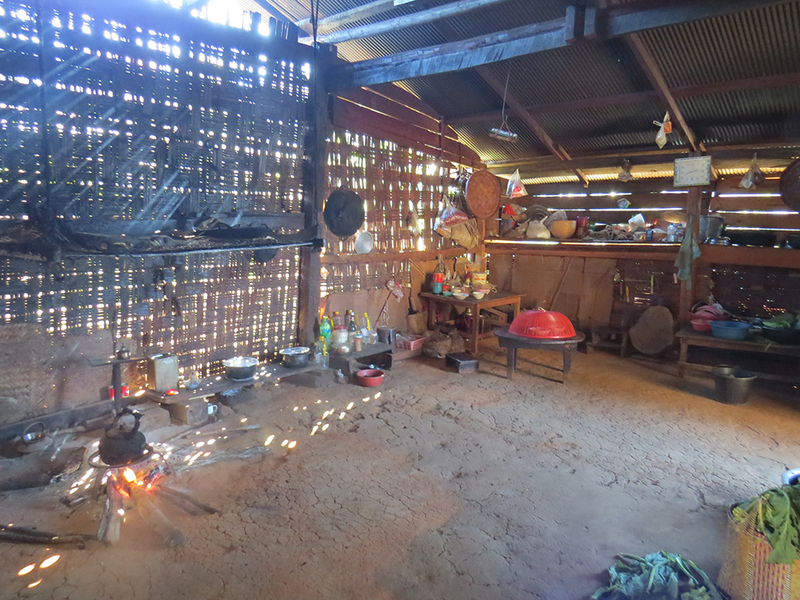 This Wa village still kept the traditional separate kitchen, using wood fires to cook their meals. The stunning Loi Mwe hill station is on the must-see list; high in the hills, at 1600 meters the air is fresh and the breezes cool. Established in 1918 as a retreat for the British colonists from the hot summers, this little town still has many old colonial buildings but, befitting a town that is not yet touristic, many are closed for entrance and one can only see the old colonial charms by peering through thick glass windows. 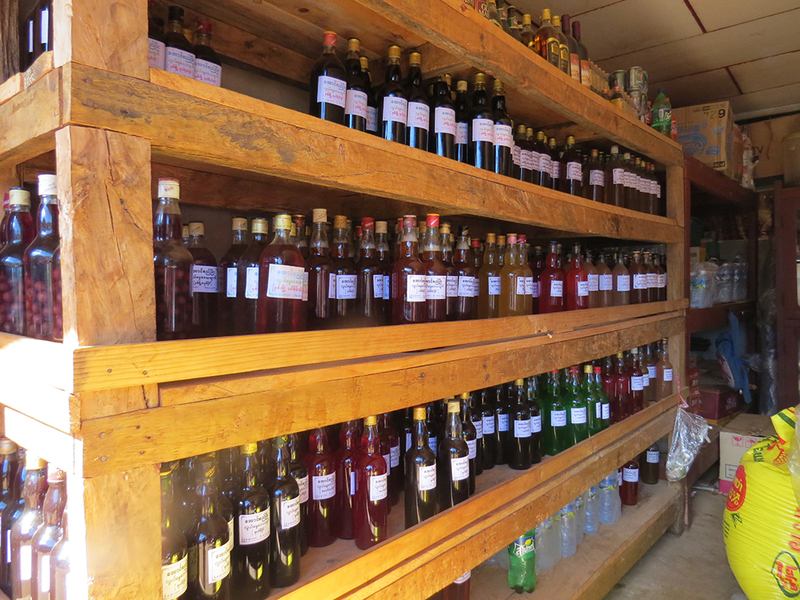 Loi Mwe is home to the colonial hill station but is more well known among the locals for its fruit, vegetables and fruit wines. The town is well-known for its fresh fruit and vegetables but it is the fruit wine brewed locally that has put the place on the local map. Cherry wine, pineapple wine, strawberry wine, and even crabapple wine is available for sale and consumption on the spot. Basic restaurants set up in the market serve up amazing local dishes and some of the best tea leaf salad around. That, along with the strong crabapple wine, makes for a very pleasant lunch break! 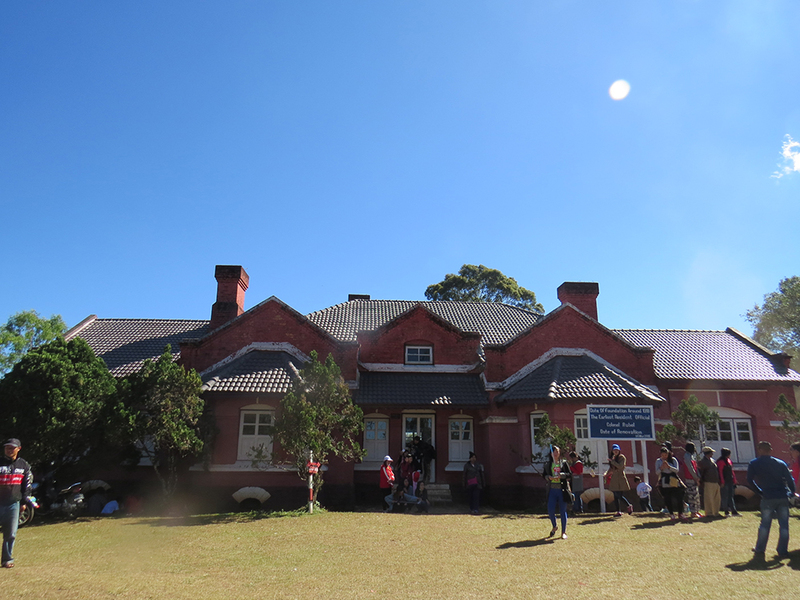 The old Governor’s House from the British colonial era is a popular place on the weekend for Kengtung city kids. There is a large temple on the hill with many steps for those working off their lunchtime aperitif, or walk across bridge that meanders across the little lake and enjoy the views. This is a popular destination for Kengtung teenagers wanting to escape the city as it is about an hour and half away, so the roaring sound of motorbikes and singing teens in large groups fills the air around the lake and the old Governor’s House. 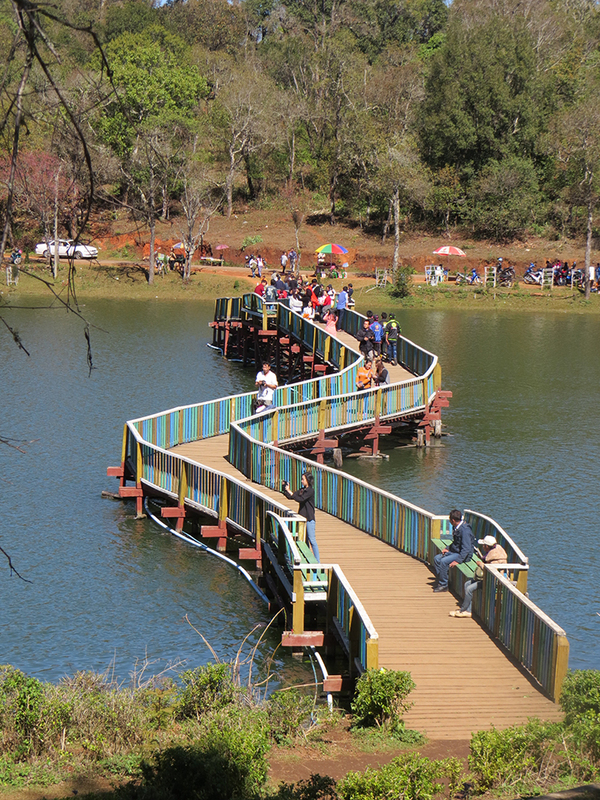 The scenic bridge across the Loi Mwe Lake is filled with local visitors enjoying the fresh air and cool breezes and of course, is the most popular spot for the ubiquitous selfie. The area around Kengtung is dotted with many different small ethnic villages including Akha, Shan, Lahu, Wa, and a tribe known as the Eng or Black Teeth, a group unique to this region. The Eng villagers here still very much follow the old, traditional animist ways. 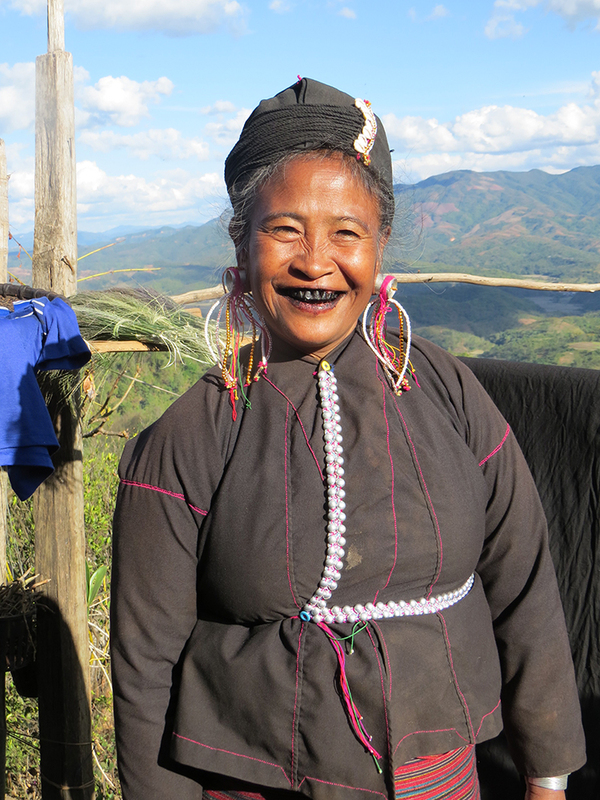 The Eng women chew betel and blacken their teeth with charcoal to heighten the effect. They eschew modernity, living high in the hills on stilt houses made of bamboo, and forego electricity, schools and medical care. Childbearing begins with menstruation and the tribe suffers a 50 percent mortality rate. However, they have their own method to ensure water year round delivered to the village and earn a few extra kyat selling trinkets to visitors. They are shy of photography so always ask before taking photos. 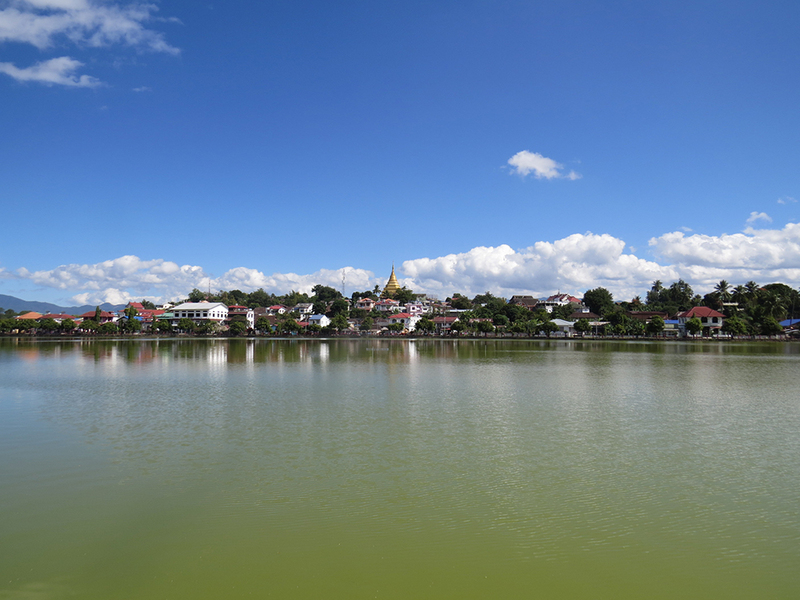 The scenic Naung Tong Lake in Kengtung, Myanmar is capped by the golden glow of Wat Jom Kai. Other ethnic groups practice Buddhism and Christianity but usually with a hearty dose of animism thrown in as they integrate the old with the new. However, headhunting was outlawed by the government and so the Wa village in Nong Kew no longer uses human heads to ensure a good rice harvest but buffalo heads. In the past the villagers would hunt heads from people far away so that the spirit could not find the village. The Sikh soldiers sent by the British were highly prized not only for how far distant their homes were but for their facial hair! Getting there takes some work. It is possible to cross over the Mae Sai border and travel overland without a visa but the traveler’s passport must be left with the immigration officials at the Tachilek border and a pass or MTT Permit issued. The Myanmar government requires travelers entering the country this way to hire an authorized guide and driver. Otherwise, a visa is easily obtained online on the Myanmar government website and can be used to cross the border or to fly in to the country. 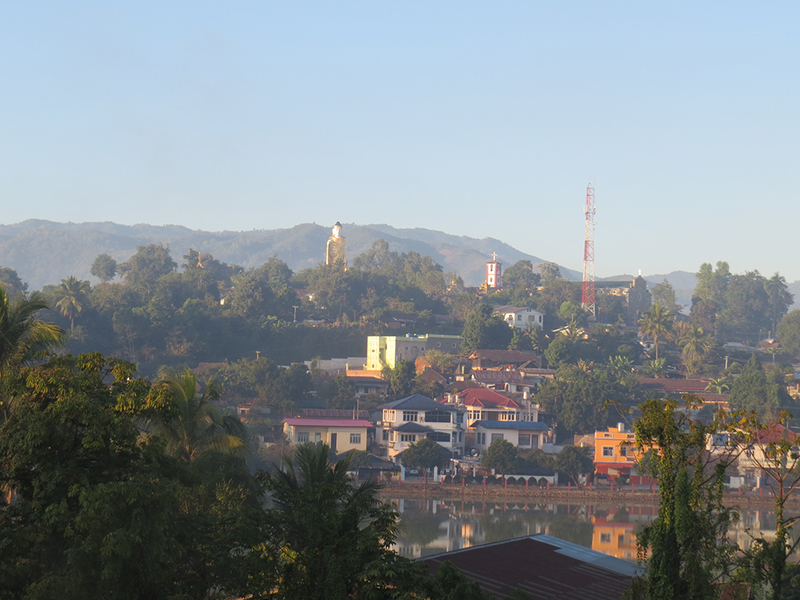 It is possible to fly from Tachilek just over the border from Mae Sai, Chiang Rai or fly from Bangkok or Chiang Mai and connect to Tachilek in Yangon or Mandalay but then the beauty of the region is missed. The region around Kengtung is unspoiled by development, indeed the roads are bumpy, narrow and in poor condition but the experience of visiting the area makes up for it all. This is not a trip for those seeking great luxury but for those wishing to see a way of life that is quickly disappearing and to experience the natural and cultural beauties of Shan State.